Kosovo Democratic Institute (KDI) has held today the round table “Vetevendosje Alternative for Kosovo-Serbia Dialogue”, in a discussion with the head of Vetevendosje Movement Albin Kurti with representatives of political parties, diplomatic representatives, civil society and the media. 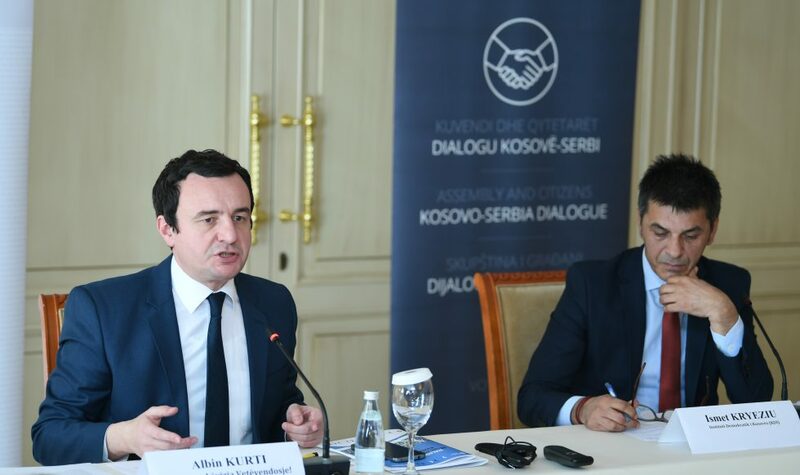 At the opening of the discussion, KDI executive director Ismet Kryeziu unveiled the report published by KDI on the work of the Assembly in the previous legislature regarding the Kosovo-Serbia dialogue. “During the monitoring process, KDI has found that the Kosovo Assembly during the Fifth legislature, issues related to the Kosovo-Serbia dialogue process discussed in 62% of the general sessions, while in 24% of the sessions held the dialogue issue was part of the agenda, “he said. The most discussed topics related to this process said that they were the First Agreement of Principles for the normalization of relations between Kosovo and Serbia, the Association of Serb-majority Municipalities, Serbian parallel structures, missing persons and the agreement on justice. “During the fifth legislature of the Kosovo Assembly, 4 draft resolutions have been adopted. Among them, the Assembly adopted for the first time a resolution calling for the suspension of the Kosovo-Serbia dialogue after the detention of the current Prime Minister of Kosovo, Ramush Haradinaj and the tension between the parties, “he said among other things. The head of the “Vetevendosje Movement”, also a deputy of the Assembly of Kosovo, Albin Kurti, stressed that dialogue with Serbia is a national theme that has constantly received the attention of citizens and public opinion. He added that one of the main problems of this process has been the overhang and ambiguity of the purpose of this process. According to him, normalization of relations as a concept is very vague and interpreted differently from different institutions and actors. Further, Kurti assessed that Kosovo should give priority to dialogue with Serbian citizens. He underlines the need for an internal discussion with all communities on common problems faced by all citizens of Kosovo, such as unemployment, health, lack of well-being and similar issues. “It is very important that the national identity is not the starting point for discussions with the Kosovo Serb community,” he stressed. Regarding the Vetevendosje Movement’s Alternative for Dialogue with Serbia, Kurti emphasized that LVV proposes to first initiate internal dialogue with Kosovo Serbs and at the same time establish a parliamentary inquiry commission to investigate implementation and non-implementation of agreements so far achieved in Brussels. Subsequently, Mr. Kurti assessed that a dialogue for dialogue, involving civil society, the academy and the media, is needed in order to discuss what dialogue we want to discuss about the format, principles, agenda and epilogue. Also, Kurti stressed that a dialogue with the EU on dialogue with Serbia is also important in order to clarify the EU’s position in relation to Kosovo’s demands in the process. Kurti stressed that LVV is about reaching a consensual position in relation to Serbia, but not for a consensual government. He added that the agenda of normalizing relations with Serbia should not prevail on the agenda for normalizing Kosovo through democratic state building and economic development. The full report “Kosovo-Serbia Dialogue in the Fifth Legislature of the Kosovo Assembly 2014-2017” can be found here. This discussion is organized under the project “Strengthening the Assembly’s Oversight to the Government and Increasing Citizen Participation in the Kosovo-Serbia Dialogue” funded by the Swiss Embassy in Kosovo.